Rain, many accidents, two red phases and a prematurely canceled race. 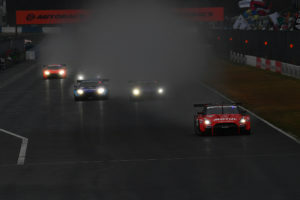 The season start of the Super GT was chaotic due to the weather. 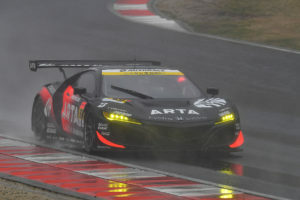 In the GT500 class won by a decision of the race director of the ARTA NSX GT (Tomoki Nojiri / Takuya Izawa). In the GT300, the K-tunes RC F GT3 (Morio Nitta / Sena Sakaguchi) secured the home win. So all participants had presented differently the start of the season and at the same time the last race in the Japanese Heisei era. Instead of sunshine as in the previous year, heavy rain caused a lot of chaos and carbon scrap. Just in time for lunch, the sky gates opened and nourished the Okayama International Circuit. According to the race start at 14:30 o'clock local time it should stop according to the weather reports actually. Instead, the rain intensity increased again, which is why the start of the year behind the safety car had to be kicked off. 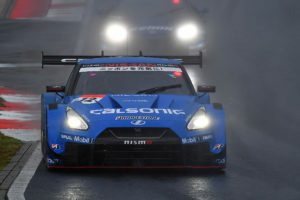 The pole position in the GT500 class secured the Motul Autech GT-R. After Tsugio Matsuda maneuvered the red Godzilla into the Q2 segment, four-time champion Ronnie Quintarellit set a new lap record in the tarmac with a 1: 16.602. A time that would have been fast enough to start from 15th place at the 1995 Pacific Formula One Grand Prix. Behind them was the Calsonic Impulse GT-R of Daiki Sasaki and Nissan newcomer James Rossiter, who finished all official preseason tests in the lead. Also the 1: 16 mark broke the reigning champions Naoki Yamamoto / Jenson Button in the Raybrig NSX-GT – and so their two brand colleagues Koudai Tsukakoshi / Bertrand Baguette (Keihin NSX GT) and Tomoki Nojiri / Takuya Izawa (ARTA NSX GT) on the places four and five. The best Lexus team was Ryo Hirakawa / Nick Cassidy (KeePer TOM's LC500) in seventh place. Toyota's luxury brand suffered in its final year – from 2020 Toyota will use the new Toyota Supra in the Super GT – a clap in that only one of the six LC500 made it into the final qualifying segment. In dry Nissan seemed to have a slight advantage over the mid-engine-powered Honda NSX-GT, which was re-classified by the GTA. Thus, the minimum weight of the vehicle was increased by 15 kg to a total of 1049 kg as at the beginning of the 2017 season. Thus, the reigning master car, which due to the MR layout does not meet the actual Class 1 rules, 29 kilograms heavier than the Lexus LC500 and Nissan GT-R NISMO GT500. At a press conference, GTA Chairman Masaaki Bandoh said that nothing would change at that minimum weight over the rest of the season. At the same time, the Super GT umbrella organization now determines where to place the balance-of-performance weights, as it is difficult to match the weight distribution of an MR car with that of an FR car. For Okayama and Fuji some of this will be installed in the front "Hub Center" of the car. However, that position could change for the rest of the calendar. At the same time Honda is allowed to use tungsten ballast, which is also used in Formula 1. However, the picture looked different in the rain. Immediately to the start in the fourth round, when the Honda NSX safety car turned back into the pit lane, after only a few turns Naoki Yamamoto already clawed the silver spot of Daiki Sasaki. However, the hunt for Ronnie Quintarelli had to wait, because in the same round of the Hoppy 86 MC and the Advics Machsaken 86 MC crashed from the GT300 class, which had the next safety car phase. After the cleanup, the field was left at the beginning of the eleventh round of the leash. At that time, the rain intensity increased again. However, Naoki Yamamoto was unimpressed – and immediately passed the leading Ronnie Quintarelli with his sensational maneuver outside of turn one. The Nissan veteran had obvious problems bringing the Michelin tires of the Motul Autech GT-R to temperature and even had to defend himself against the Calsonic Impulse GT-R. This took Koudai Tsukakoshi (Keihin NSX-GT) out to stalk the two GT500 Godzilla. Spectacularly, they threesurfer the straight down to the hairpin, where ultimately the Honda rider prevailed against the two Nissan cars. While Naoki Yamamoto hurried after just one lap by 1.9 seconds, Tomoki Nojiri (ARTA NSX-GT) clasped the fourth place of Daiki Sasaki. However, the battle should not last long. 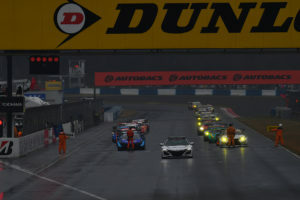 Because of a serious accident, which threw three GT300 vehicles in the Moss-S out of the race, the race management in round 14 interrupted the event for the first time with the red flag. During the compulsory break, drivers like Heikki Kovalainen confirmed to J SPORTS how difficult the conditions were. In addition to the poor visibility, a lot of water had accumulated in some places due to the increased rain intensity, which increased the risk of aquaplaning. After the 45-minute break, the field was again sent behind the safety car on the trip. 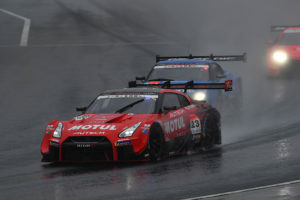 Ronnie Quintarelli had to quarrel again with the operating temperature of his Michelin tires at the restart in the 20th round, whereby Takuya Izawa almost playfully passed the hairpin on the Motul Autech GT-R. At the top, Naoki Yamamoto broke away a bit from Koudai Tsukakoshi. However, last year's Okayama winner did not give in and nibbled successively ahead of the Raybrig NSX-GT. Three laps later he was already stuck to the back of the reigning champion. One lap later, Tsukakoshi attempted an attack in Turn 1, but braked on the wet piste, and crashed into the rear of his brand colleague. Naoki Yamamoto flew in the gravel bed, while Tsukakoshi could continue without visible damage. Immediately, the race organizers again sent the safety car on the track to recover the stranded Raybrig Honda. Behind the security vehicle also flew GT300 driver Ryosei Yamashita (Arnage AMG GT3). However, worsening conditions forced the officials to another red phase in the 31st round. Shortly thereafter, a meeting with the team bosses was ordered, in which the premature race was decided. GTA Chairman Masaaki Bandoh stepped up to the 17,400 fans (28,400 spectators throughout the weekend) to declare a premature end. The riders then lined up in front of the grandstand to thank the fans for coming and staying in the rain. However, they still had to wait for the nomination of the GT500 winner. Needless to say, the incident between Koudai Tsukakoshi and Naoki Yamamoto was investigated by the stewards. After several minutes of waiting it was clear: Tsukakoshi was added 34 seconds to the overall result for an avoidable collision, which corresponds to the loss of time of a drive-through penalty. Thus, the Keihin NSX-GT flew to 14th and penultimate place – a position in front of the Raybrig NSX-GT, who was recovered with one lap residue from the gravel. Yamamoto, who did not want to leave the car during the red phase, looked very angry. Thus, at the end of the day, the winners were Tomoki Nojiri and Takuya Izawa, who start the New Year like the old one, with a win. For ARTA, it was the only second triumph in Okayama since 2007. "Personally, I'm a bit doubtful about winning as he came into punishment because of the collision of the other two Honda cars. But I'll just accept it as a good start to the new season, "said a very humble Takuya Izawa after the race. "I had no idea where I was at all. From fifth place I could not see anything except the spray. Somehow, I managed to pass the two Nissan GT-Rs, which ultimately led us to victory. "" It felt like forever before the race ended, "team-mate Tomoki Nojiri said. "I'm overjoyed that we won the race and none of the injured drivers injured themselves. We owe today's win to Izawa-san, who took the only two chances to pass the Nissans. 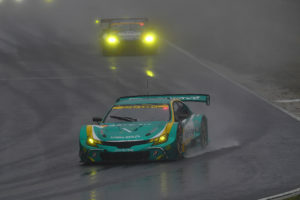 "For Takuya Izawa, who joined ARTA in 2018, it was his seventh Super GT win. For Tomoki Nojiri it was the fourth victory. Tsugio Matsuda / Ronnie Quintarelli (Motul Autech GT-R) as well as Daiki Sasaki / James Rossiter (Calsonic Impulse GT-R) had to settle for the remaining two podium finishes. Nevertheless, the conclusion was positive. So Ronnie Quintarelli explained that they were significantly faster than after the two preseason tests. The biggest problem was the tire temperature at the Restarts, the Italians could only build after a few laps to a working degree. The many safety car interruptions, however, mean that it sank again and again in the basement. Similarly, Daiki Sasaki had to report, whose Bridgestone rubber also did not immediately come to temperature: "I think that this is one of the big differences from the Honda package, the faster get the heat in the tires. That's what we have to work on. "Teammate James Rossiter, meanwhile, welcomed the race director's decision to stop the race prematurely. "Of course we wanted to win the race but still I am very satisfied with the result. We should be well prepared for Fuji, "said the new impulse. The Top-5 were completed by the Craftsports Motul GT-R (Kohei Hirate / Frederic Makowiecki) and the Realize Corporation Advan GT -R (Mitsunori Takaboshi / Jann Mardenborough). In particular, Makowiecki literally went over the water. The Frenchman, who last drove for Honda in the Super GT in 2013 and joined Nissan together with former Toyota protégé Kohei Hirate, is working his way up from eighth to fourth. Best Lexus was the Weds Sport Advan LC500 (Yuji Kunimoto / Sho Tsuboi). Similar to Makowiecki, last year's GT300 driver and Formula 3 record winner Sho Tsuboi swam from tenth to sixth place. Ryo Hirakawa / Nick Cassidy (KeePer TOM's LC500) returned to twelfth place due to a problem with the vehicle after the first red phase. With less than 75% of the race distance, only half championship points were awarded for the first time in the 25-year history of the championship. However, this also means that the weight handicaps for the Golden Week long-distance classic at Fuji Speedway will be significantly lower. At the preseason test at the end of March, Nissan and Lexus showed off their muscles. Similar to the GT500 class, the records in the GT300 tumbled in qualifying. With a 1: 24.889 rookie Nirei Fukuzumi put the ARTA NSX GT3 on the pole position for the first time with a new lap record. Thus, the former Formula 2 driver prevailed by just 0.016 seconds against GT300-rookie Sena Sakaguchi in the K-Tunes RC F GT3. The Saitama Toyopet GreenBrave Mark X MC (Shigekazu Wakisaka / Hiroki Yoshida) also celebrated his best qualifying result so far with third. 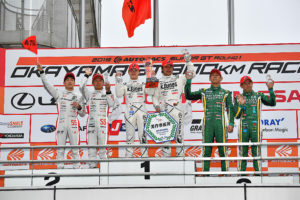 The top-5 was completed by defending champions Haruki Kurosawa / Naoya Gamou in the Leon Pyramid AMG and the Hoppy 86 MC (Takamitsu Matsui / Kimiya Sato). However, the joy over fifth place on the grid for Tsuchiya Engineering should not last long, as new signing Kimiya Sato, who drove the last seasons for JLOC, slipped into the barrier on the wet lap on the fourth lap. Yuya Hiraki, who started directly behind in the Advics Machsyaken MC 86, was unable to dodge in time, crashed into the Hoppy 86 MC and also dropped out after only a few kilometers. The accident called the safety car on the track. 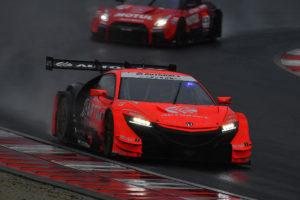 Previously, Shinichi Takagi (ARTA NSX-GT) defended his pole position against Morio Nitta in the K-tunes RC F GT3 experienced by his team-mate Nirei Fukuzumi. However, after restarting on the eleventh lap, the ARTA rider made a small mistake, which Morio Nitta used consistently to take the lead. In the 14th round, the previously mentioned accident, which forced a 45-minute break with the red flag. Kazuki Hoshino (Gainer Tanax triple a GT-R) came off the line in front of the Moss-S and lost some momentum when accelerating out. This was attempted by former GT500 driver Takashi Kogure, who was fired by Honda earlier this year and now found a new cockpit at JLOC to take advantage of the Manepa Lamborghini GT3. Unfortunately, Japanese racing legend Kazuyoshi Hoshino's son just closed the open gap at the same time, causing both cars to touch. While the Manepa Lamborghini GT3 got away with a few scratches, the Gainer-Nissan flew off the track, slammed brutally into the barrier and then flew back onto the tarmac. Joao Paulo de Oliveira (D'station Vantage GT3), who lost his Nissan GT500 cockpit at the beginning of the year, similar to Kogure, and switched to the GT300 class at D'station Racing, was unable to dodge in blind flight in time for the crash Boliden by Kazuki Hoshino. Behind them, Takayuki Aoki (Runup Rivaux GT-R) and Marchy Lee (Eva RT Test Type-01 X Works GT-R) touched each other while attempting to avoid the accident, causing the latter to land on the grass and hit the track. The race direction immediately interrupted the race with the red flag. Fortunately, all pilots survived the accident unhurt. 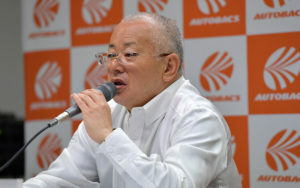 Morio Nitta's maneuver should turn out to be crucial as Shinichi Takagi failed to regain leadership at the final restart. "I am happy that we have won today," said the 51-year-old Japanese, who took 21 GT300 victories again the top spot on the leaderboard in front of his rival Shinichi Takagi. "It was a very difficult race though. In second place I could hardly recognize anything because of the spray. It was not until I took the lead that I got a picture of the conditions. When the safety car came out and I saw the crashed vehicles, I realized how difficult it must have been for the others. "" Even though I could not make a lap today, I think I could help the team with my qualifying performance, " added his 19-year-old rookie team-mate Sena Sakaguchi. The former Honda protégé is thus one of the few pilots who could prevail in their first Super GT race. "When I saw Nitta-san passing Takagi-san, I knew that was just the only moment he could try it. I just thought: madness! ". K-tunes Racing's Okayama-based squad celebrated their first win in their home race. Just under the podium Takuto Iguchi / Hideki Yamauchi missed fourth place in the Subaru BRZ due to a clash between the Gainer Tanax GT-R (Katsuyuki Hiranaka / Hironobu Yasuda) and Realize Nissan jidousya daigakkou GT-R (Kazuki Hiramine / Sacha Fenestraz) benefit. Yasuda was punished with a 34-second time penalty for putting down another vehicle after the race – and flew back to 21st place. The GT3 Nissan by Kondo Racing, whose team consists entirely of students from the Nissan Technical College and selected mechanics from various Nissan dealers and moved from the Super Taikyu to the Super GT this year, slipped to fifth place. 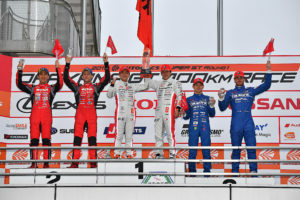 In sixth place came the defending Haruki Kurosawa / Naoya Gamou (Leon Pyramid AMG) to the finish, which represented six different brands in the first six places. Less successful was the race for the new vehicle models. As already mentioned, the D'station Vantage GT3 (Tomonobu Fujii / Joao Paulo de Oliveira) crashed after suffering from transmission problems in qualifying. D'station Racing moved from the Porsche to the Aston Martin camp in the winter, bringing the British luxury brand to the Super GT for the first time since 2014. It was only marginally better for McLaren Customer Team Japan, which is the legendary team Goh, who dominated the GT500 class with the McLaren F1 GTR in 1996 as Team Lark and celebrate their comeback in 2019. However, Seiji Ara / Alex Palou with the McLaren 720S GT3 did not get past the 19th place with a painstaking tribute to the success at the time. Like D'station Racing, the Eva RT Test Type-01 X Works GT-R (Shaun Thong / Marchy Lee) was involved in the pile-up in the 14th round. Behind the ominous name X Works hides Phoenix Racing from Hong Kong, the second non-Japanese based team after Panther arto Team Thailand. For example, team owner Marchy Lee wanted to compete in Japan with the name of their own umbrella organization, which also includes Phoenix Racing. The next Super GT race will take place on Saturday 4 May 2019. The 500-kilometer Golden Week classic at Fuji Speedway is not just the first long-distance race of the year, but also the first race in the Reiwa era, starting three days earlier. 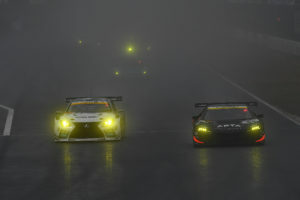 Super GT fans outside of Japan looked into the tube this Sunday: Unlike the years before, the start of the season from Okayama was not broadcast live on YouTube. The reason: NISMO TV ended its involvement on the video and streaming platform. The company Grand Central Entertainment, which was commissioned by Nissan to produce the content for its own YouTube channel, although under the new name Let's Go Racing planned to continue, but could not sign a contract for the first run. Accordingly, the numerous fans worldwide were disappointed. The many international super GT drivers also gave their displeasure on the social media to protocol. Nick Cassidy even put a text message into the camera reading "Bring back International TV" during the driver's presentation. At a press conference, GTA Chairman addressed the current situation. He said that a contract was signed with Haro Sports Entertainment of Malaysia, which also act as promoter for the after-race of the Super GT in Sepang in 2020. From now on, Haro Sports Entertainment will act as distribution partner for the international broadcasting rights and will sell corresponding licenses to interested TV stations as well as streaming platforms outside of Japan. From the upcoming race on Fuji Speedway, the Super GT will be broadcast live on Malaysian television. Masaaki Bandoh said that Haro Sports Entertainment has the infrastructure to ensure worldwide distribution of the TV images via satellite link. Although after the end of NISMO-TV it looked like there were no more international broadcasts, the GTA Chairman reiterated that the current partnership is part of the vision to expand the global audience. For this you have additionally set up at your own expense a cabin for an official English commentary, which can also be used for live broadcasts. Starting this season, all full-length races will be uploaded to the official YouTube channel of the Super GT every three weeks, with both Japanese and English commentary. According to the Japanese magazine Car Watch, upon request, an official of the GTA confirmed the desire to continue to transmit the Super GT outside of Japan in the future. However, one first has to investigate all possibilities, while at the same time the "profit of the transmitting stations, on which the costs burden, must be protected." One works on a suitable solution. However, it is not known if this will be the second race of the season for European audiences in three weeks time.